There are many different types of anxiety – and all can be overwhelming. The counsellors at Waypoint Counselling in Victoria, BC are reporting more and more clients who are struggling with some anxieties. 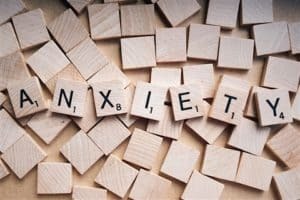 This post will list and briefly describe the different types of anxiety, but first and foremost, it is important to discourage anyone self-diagnosing themselves. What is more important is to identify the root of what turns your particular fear, anxiety, worry or obsession into the problematic life-feature. Identifying and focusing on the core matter should be the aim. These are defined as a strong fear and avoidance of a feared object/situation. A person typically recognizes the fear as unreasonable and excessive, but knowing that doesn’t have much impact of the urge to escape/avoid. The most common fears are animals, heights, closed spaces, blood and injuries, storms and lightening, and flying. Many of these can be rather easily avoided. However, should avoidance ever get in the way of what one needs to do or would like to do, then a problem is beginning to form. This is an intense fear of embarrassment or humiliation, which often-times become apparent in situations one is exposed to scrutiny. These fears include public speaking, blushing in public, being watched at work, crowds, public toilets. Typically, folks will actively avoid social situations. This is when being neat, tidy, orderly and organized is done to the extreme. Obsessions are recurring and persistant thoughts, impulses and images that trigger anxiety. These are also unreasonable and distressing. Compulsions are ritualistic type behaviour (like hand washing, or counting, or checking locks) are repetitive. Their intention is to reduce anxiety and neutralize any disturbing thoughts or images. These are both enormously time-consuming activities, which interfere with social functioning and daily activities. General Anxiety Disorder, or GAD, features excessive worry about varying events and activities. The sense of feeling stressed and/or overwhelmed by daily “hassles”. GAD tends to develop over an extended period of time. Different Types of Anxiety: What The Common Thread? It turns out that there are more characteristics in common through the various anxiety disorders. What’ important to note is that when it comes to helping, the similarities are particularly strong. Triggers lead to Anxiety and Fear. The number of possible triggers are infinite, but for some anxieties, knowing the source of the trigger can assist in anticipating and developing a plan to respond. Anxiety and Fear ebb and flow. A common experience is that anxiety last a long time. But it really doesn’t. In real time, an anxiety experience won’t typically last longer than 30 minutes, and very rarely up to 60 minutes. Folks may perceive that experience lasting much longer, but this is more to do with our minds and thought processes, rather than the actual physical experience. Fear is anxiety, anxiety is fear. Sounds funny, but fear is a common characteristic of anxiety, and both tend not to differ experientially from one another. To note here is that the experience of fear and anxiety by those with an anxiety disorder does not differ from the experience of those without an anxiety disorder. Even though there are lots of different types of anxiety disorders, successful treatment strategies tend to work for all of them. That is, the most effective counselling approaches for anxiety tend to focus on a small, specific set of common Cognitive Behavioural Therapy exercises and skill-building tools. Waypoint has experienced counsellors located in Victoria, Langford, Sooke, Colwood, Metchosin and Nanaimo. Check out our team members or if you are not sure which one to choose, contact us to speak with our Clinical Director George Bielay. He will help narrow down your search so that you are matched with the most appropriate counsellor. Either way, you can book a 30 minute free session to meet your counsellor to see if it is a good fit before beginning your therapy. More information on different types of anxiety can be found at AnxietyBC.